I dread January not because of the cold temperatures, but because the close, indoor contact with everyone else spreads nasty gastrointestinal illness. Last winter, the first time I tried parenting my two boys solo during my husband’s business trip, my toddler and I were struck with GI bug. And I was pregnant! It was terrible. At least this year, when a birthday party host called after the party to inform us that the birthday boy had a stomach bug…at least this year I had my partner home to help! As these illnesses tend to do, this one struck us one at a time with several-hour overlap. So there were always at least two people down for the count! Even though I’m a grownup lady fully capable of taking care of myself and a bunch of kids, I have some special circumstances right now: I’m tandem nursing a 5-month-old baby and a toddler. For me, hydration is even more important. Hydration for me is vital! I needed to maintain my own hydration levels so I could continue nursing my wee baby, who depends on me for both food and antibodies that might help him stay well. I also needed to nurse my poor toddler, who couldn’t keep anything down except for breastmilk at a time when he also needed extra hydration. I’m hydrating for 3 over here, and I can’t be running around washing towels when I need to focus on taking tiny sips of Gatorade every minute. As awful as it is to have to do anything while I’m sick, I know that it’s important for me to keep nursing my baby while I’m ill. When my husband was well, he kept the baby with him and only brought baby to me in bed to nurse when he was hungry. When my husband was down, I camped out in bed with the baby and pretty much only got up to get diapers and fresh Gatorade. It was a challenging 48 hours, to say the least. Towels. We heaped stacks of clean towels in every room of the house so they were constantly at the ready. The washing machine was kept in constant motion. We pre-emptively lined the beds and couch with towels. This made clean up a little easier. Clear Gatorade. I know lots of people who make their own electrolyte drinks at home. Bless them for having the spare energy to do that! Probably they ingest way less sugar and artificial stuff. It was all we could do to beg a friend to hold her breath, drop Gatorade on the porch for us, and run away while we sent her money via PayPal. Clear is very important because of laundry and staining and you get the picture. Breastfeeding Resources. Thankfully, I have several friends who are La Leche League leaders and I relied on them for questions related to my nursing and milk supply during our bout with this illness (for instance: was the milk I pumped while sick safe to send along to daycare later in the week?). Kellymom, written by an IBCLC, offered reassurance and more information to set my mind at ease. Tiny sips, very frequently. Since I so desperately needed to keep fluids in my body, I had to take tiny sips of liquid very slowly, very frequently. I couldn’t tolerate the sweetness of the Gatorade, but needed the electrolytes, so I watered it down even more and just lapped at it gradually. My pediatrician. I wanted to keep my pediatrician informed, because my baby was not only showing signs of diarrhea, but I also wanted to make sure my own dehydration didn’t cause him to have less milk than he needed. After consulting with my pediatrician and with LLL and with Kellymom, I learned what signs of my own dehydration: increased thirst, dry mouth, lightheadedness, decreased urine output. And then serious signs of dehydration like confusion and heart palpitations. Thankfully, I didn’t have to do anything further to make sure I could rehydrate. I learned what healthy signs to look for to know my baby was probably doing ok: tears or wet eyes, one wet diaper every 6 hours, slobber or drool. Apart from that, we just had to ride out the storm together. When it was all over, I was so amazed that a friend brought us a vat of chicken soup. We eagerly lapped up the salty broth and let the meat and vegetables replenish our bodies. What a gift! 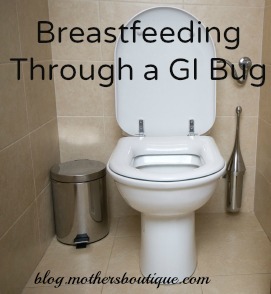 Has your family weathered a GI bug while you were breastfeeding? Leave us a comment to share your tips for making it through.